The canyon section of the South Fork is one of the last great overnight scenic trips in the west. 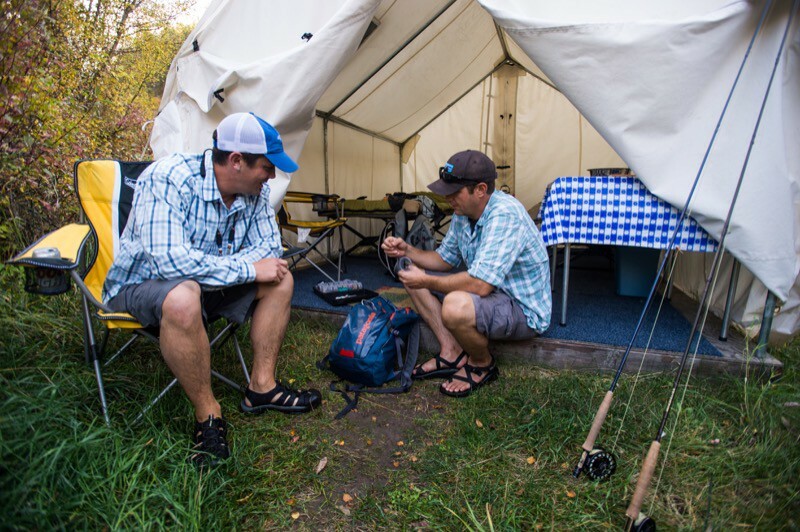 Three Rivers Ranch along with their award winning guides and staff will provide an overnight camping experience that can only compare to a night at the Ritz. 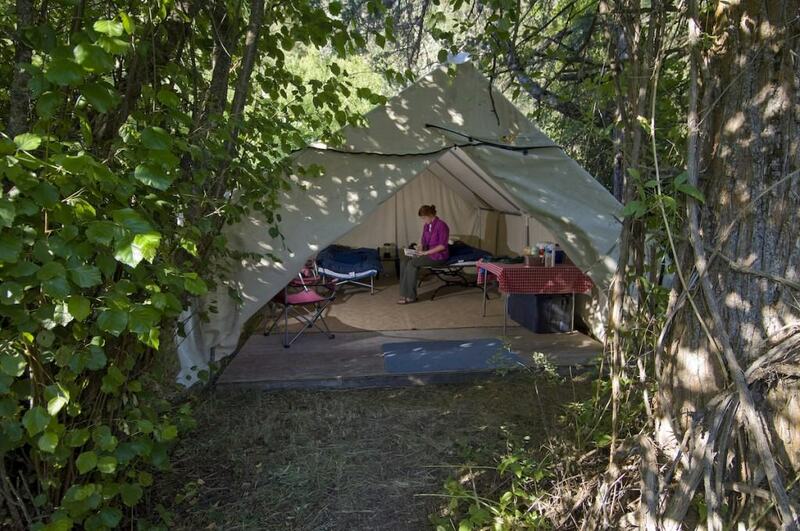 The camp sits in the deep canyon surrounded by towering cottonwoods. 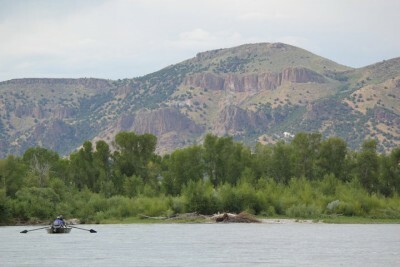 An abundant variety of wildlife inhabits the canyon, Bald eagles, peregrine falcons, and plenty of moose to name a few. Your day starts with your departure from the Ranch around 8:00 a.m. You will be required to pack an overnight bag with necessities of a personal nature. 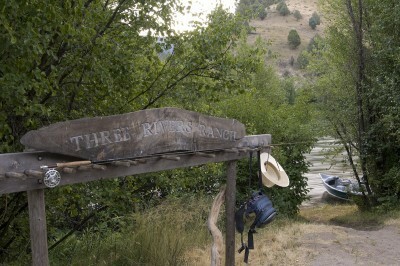 Three Rivers Ranch staff will take care of getting your bag to and from the camp. You will then drive with your guide to the Spring Creek access near Swan Valley, ID. 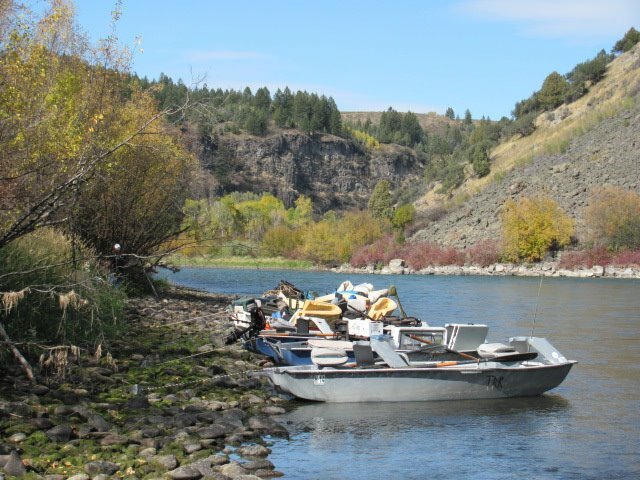 The South Fork has a population of well over 7000 fish per mile, with wild cutthroats averaging 14 to 16 inches, as well as rainbows and hybrids. 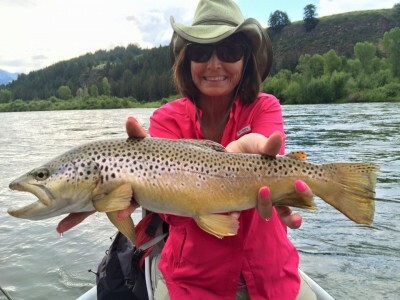 You will also find brown trout that can grow much larger, with a fish or two more than 10 pounds. 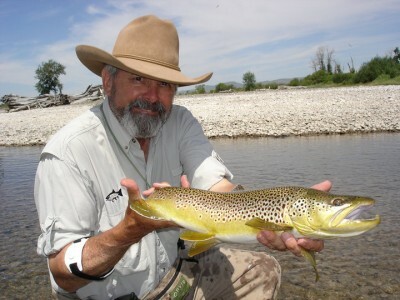 The South Fork was the home to the Idaho State record brown trout weighing in at 26 lbs. 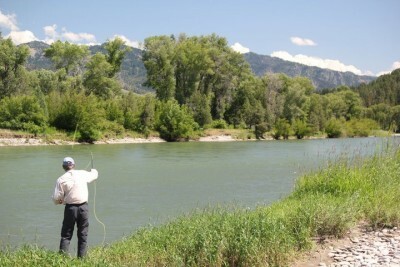 Although the South Fork is best known for its dry-fly fishing, streamer fishing, casting big flies undercut banks or dead drifting a bead head nymph, along the numerous gravel bars can be very effective. 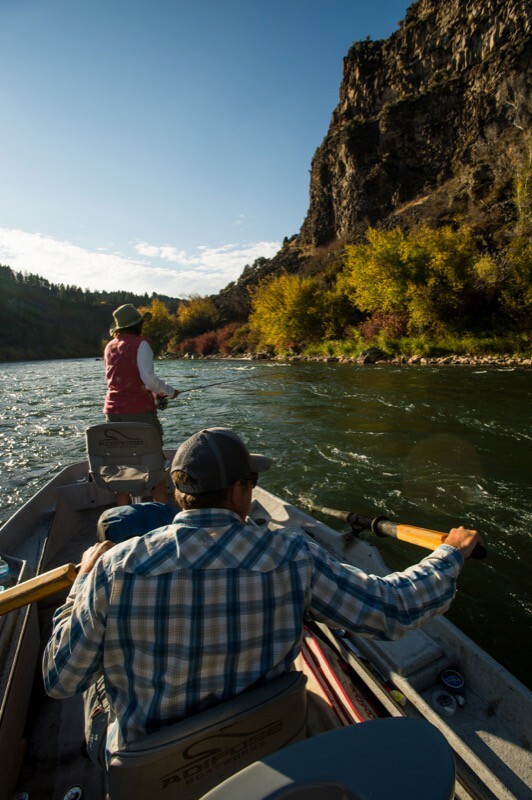 Whether you choose only to drift or to stop along the numerous gravel bars to wade some of the smaller channels, your day on the South Fork will be truly memorable. Upon arriving at camp, you will find cocktails and hors d’oeuvres served around a roaring campfire. Pull up a chair and relax. 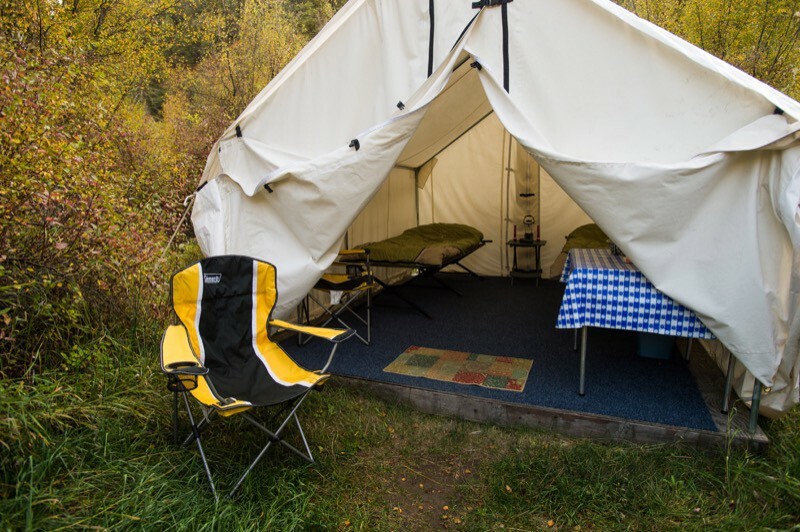 Your personal items are ready for you to settle into your luxurious 10×12 canvas wall tent. 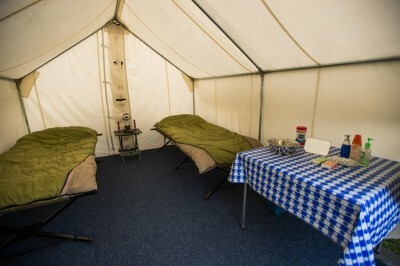 Each guest tent has carpeted wood floors, cots with mattresses, night stand with a lantern, washing area with hot water delivered to your tent in the evening as well as in the morning; nylon sleeping bags lined with sheets and a zip-in polar fleece liner. If you are in the mood for a hot shower well, you’re in luck! Upon request, there is a heated pressure-shower, with fresh towels and changing area. As the sun sets in the canyon, you will hear the sounds of the rushing river or an owl off in the distance. Your dining experience will be under a canopy of stars. Chef and camp-jack will take your order for a grilled USDA Prime Rib-eye steak prepared to your specifications. Add to that hors d’oeuvres, toasted parmesan baguette, grilled corn on the cob, Justin’s famous baked beans, BBQ glazed potatoes and homemade peach cobbler with whip cream. If you do have special dietary requests, we will do our best to accommodate them. 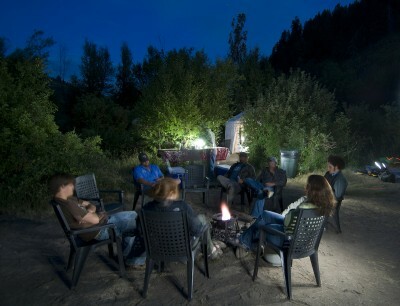 After dinner, relax around the campfire with your travel companions and guide. Share a few stories, a cup of decaf coffee or indulge yourself with a cocktail. Awaken refreshed to the tantalizing aroma of hot coffee and the sweet smell of bacon sizzling. As you prepare for your day enjoy a hearty western breakfast of Idaho potato pancakes, bacon or sausage, biscuits, scrambled eggs, fresh fruit, coffee, and juice. 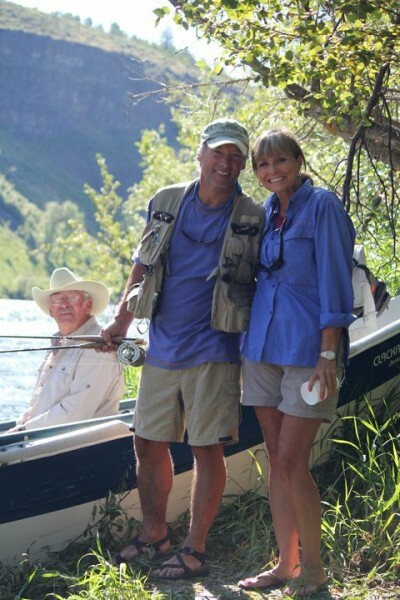 During breakfast, you and your guide will discuss your options for another day of angling on the South Fork of the Snake River. 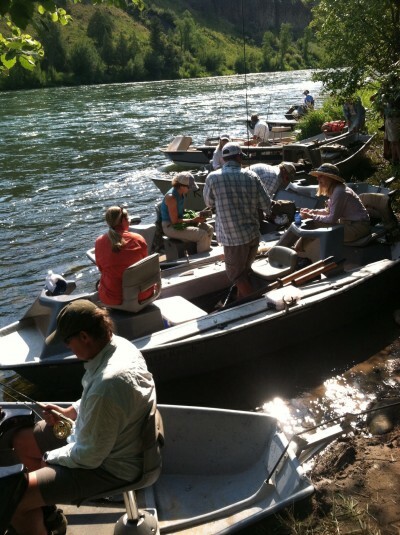 The South Fork of the Snake fishes best from mid-July through October. 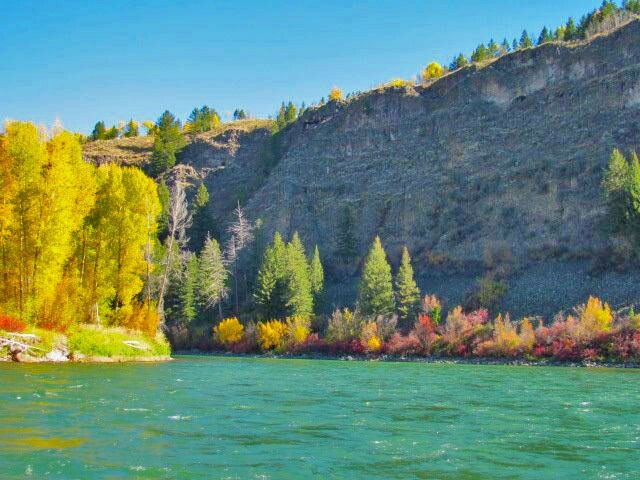 If you are staying at the lodge day trips to the South Fork are available at no additional cost but driving distance (1 hour 15 min. one way) makes the overnight stay at our outpost camp sensible. 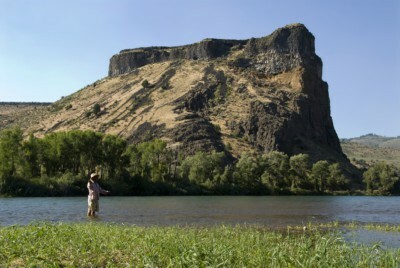 Three Rivers camp can accommodate a fishing party of up to eight (min. four). For guests staying at the ranch, there is a surcharge of $250 per person/double occupancy or $275.00 single occupancy for the overnight camp. Average Temp in July & August!